Back: Jun Saeki,Takashi Hakii, Mieko Towada. Thanks to Nihonbashi Tei restaurant, Shibuya. We've all had a great idea at some time or other that might have made us rich. Alas, we took it no further than wondering why no one else had ever thought of it. So instead of preparing for an IPO, I'm working bleary-eyed on this story, and you're reading it on some crowded commuter train. Askul Corporation, Tokyo-based office supplier and the leading proponent of e-commerce in Japan's retail industry, is the result of someone carrying a great idea to fruition. During the bubble economy of the late 1980s, Japanese corporations became the nouveau connoisseurs of the art world, snapping up masterpieces one after another with little regard to either quality or price. Today, as many as 10,000 paintings, valued at JPY 1 trillion ($9.5 billion), are stored in bank vaults, secured by the banks as collateral against loans to failed corporations. Don't believe the lawmakers when they sat that law can protect your privacy. A cure for the mid-management flu? 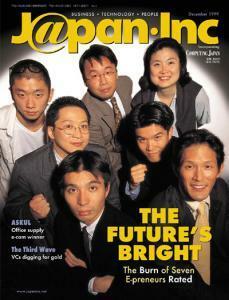 Back to the future with Fujiyo Ishiguro, president and COO of Netyear Group Inc.
DDI and IDO to Merge? DDI, the number two domestic telecommunications carrier, and IDO, a cellular company affiliated with Toyota Motors, are reportedly in their final stage of negotiations regarding a potential merger, targeted for April 2000. In July this year, a personal site set up on Nifty Serve received over a million hits. From July 11 to 17, the URL held steady as one of the top five sites accessed from both home and office on Nikkei BP's weekly rankings. At almost the same time, one Web page on the Toshiba Japan site was also receiving lots of attention. What was the fuss about? Who governs the Internet? In Japan, a country famous for the ambiguities inherent in its culture, politics, and law, this question is more difficult to answer than you may think. Thirty-five million page views of Yahoo! Japan per day, an equally staggering seven million daily visits to the Nikkei Index, and Merrill Lynch is calling the Japanese Internet market the "next big thing." Who said the Japanese were to be tripped-up by their own inflexibility toward Internet connection rates, credit card use, and security issues surrounding personal data and so forth? Phooey. Forget it. Of course, people like me, who wish mobiles (keitai in Japanese) -- and the people whose ears are skin-grafted to them -- would just go away, are going to be disappointed. Previously unthinkable transmission speeds are coming, bringing with them color LCD screens, Java software, audio and video capabilities, and global positioning system (GPS) functions that will allow users to pinpoint their precise location (i.e., right next to someone trying to enjoy a meal in peace). Small and medium enterprises (SME), employing the vast majority of Japan's workforce, have long underpinned Japan's economy, but they're going out of business faster than new ones can replace them -- so fast, in fact, that in a macabre statistical twist, the overall life expectancy for males went down last year, skewed by the suicides of small businessmen whose companies had collapsed. NTT Communications Corp., the long distance and international arm of NTT Corp., will soon launch a new domestic high speed backbone service. NTT Mobile Communications Network Inc. (NTT DoCoMo) and three others have announced plans for a JPY 5 billion (US$47.2 million) venture capital fund that will invest in companies developing mobile communications, and Internet and related businesses.